In light of the recent announcement from Kodansha USA, we would like to share the results from the manga portion of Operation Moonrise. We think fans will find the totals very interesting to compare with the announcement! Question: Which Manga would you like to see published? The total number of respondents was 522 for this survey. This question was multiple choice, with respondents permitted to check off as many options as they liked. We are glad to see, upon consulting our survey results, that the recent announcement reflects what the fans have been asking for. We also hope our readers will enjoy being able to purchase the new graphic novels starting in September! We have some very exciting news for our readers today! 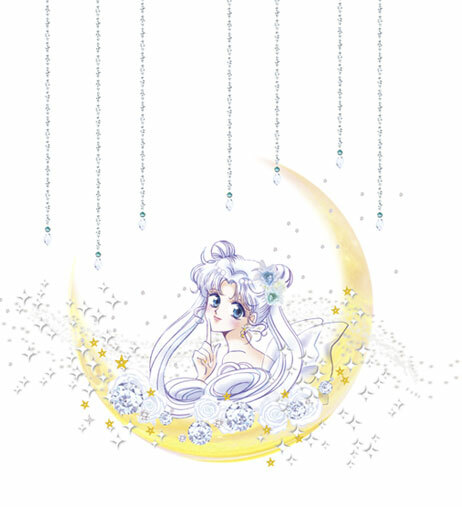 The Sailor Moon manga will be relaunched by Kodansha USA, and the Sailor V manga will also be published by Kodansha USA, in print in the US for the first time! Volumes will be on sale starting in September. Hi Moonies – I have received confirmation that Naoko Takeuchi, Yoshihiro Togashi, and their family, as well as employees of Toei Animation are safe. They were all in the Tokyo area which was not as severely affected. However, their major worries now are the massive cleanup, traffic, and electrical power now that their tsunami woes are not a concern. Fans wishing to donate to relief efforts are best off doing so through the Red Cross as the UN has not established an effort just yet. In the USA, click here to donate. In Canada, click here to donate. Fans can also donate via Twitter, Text Messaging, and Facebook. Alternatively, fans can also donate to Shelterbox, which is sending shelter kits to those affected in the Sendai region of Japan. 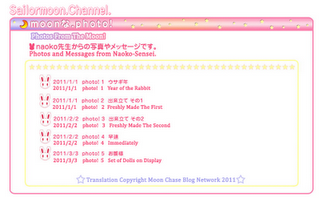 Naoko Takeuchi Posts New Photos on Sailor Moon Channel! Our entire thoughts are with everyone affected by the Tsunami tragedy in Japan. In the coming days, we will post an entry with charities and relief efforts for readers who wish to help out Japan. 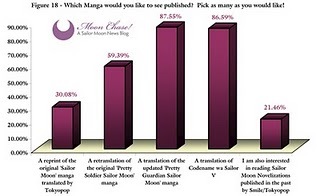 As far as we know, no one involved with Sailor Moon has been affected. It is probably safe to assume that since most of the major dubbing studios are in Tokyo (which was not as devastated as the northern part of the country), that most of the stars, crew, and the creator are safe. We are currently working to get official word on the safety of Naoko Takeuchi, Yoshihiro Togashi, and their family. There is some discussion happening via our Facebook page and our forums, where our staff members and fans are compiling together lists of who has been confirmed safe. 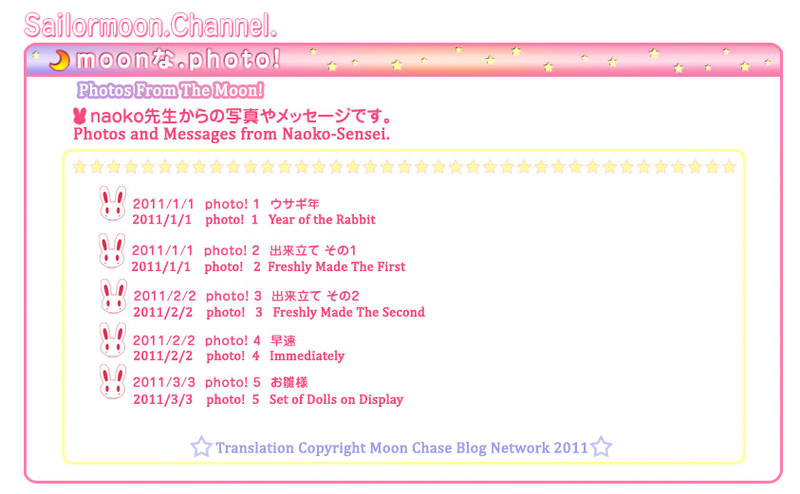 Happy Fourth Anniversary, Moon Chase! While it may have been late in this day full of chaos to remember what day it was today, it is never too late to acknowledge the reason why we are here. To our fans, friends, and loyal readers who have stuck with us through the thick and thin, thank you for your continued support! We will be here to bring you everything we possibly can in the Sailor Moon world, and your support continues to drive us! We would not have continued with this site past the first week were it not for your support and love! To Naoko Takeuchi, Toei Animation Inc. , Kodansha, and all of the actors and actresses who continue to “Sail On” with Sailor Moon, we thank you for bringing us an anime, manga and dorama that is so much more than what we have seen. 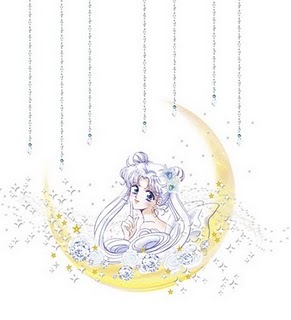 You have created a pop-culture phenomenon that has touched almost every corner of this world, and we wish, hope, and aspire for the continued success of our Moon Princess as she is resurrected for many years to come! To my staff, there are not enough words in the English language to say how thankful I am to have you all on this journey that has become about so much more than blogging! Thank you for your energy and continued enthusiasm, especially in these times when I’m not able to be around as much as I used to. Your ideas have all helped to shape this blog into what it has become, and you are all amazing to have gotten to know behind the scenes. Here’s to more of our collective “inside jokes”, reminisces, writer’s block, neverending chasing, and that blonde superhero this site is dedicated to. Though sometimes her trials and tribulations make us all scratch our heads or go crazy trying to chase every detail, at the end of the day she has made our love turn into a different kind of appreciation. Let’s keep this going!